It’s a bit surreal writing this piece about my journey into the rhino horn war, with the Californian sun warming my skin. I’m a long way from home and yet it is clear that rhinos don’t have passports. The reception of STROOP in the US has been incredible, starting with the film’s World Premiere at the San Francisco Green Film Festival. I was of course nervous having never publicly screened the film! But seeing the drama of the film displayed in those watching who were hugely moved by the film was a relief and more so… a sign of hope. People all over the planet do care about the slaughter of our rhinos in South Africa and it is not a fight we have to fight alone. I’ve seen the best and worst in humanity in the past four years making this film. The dark, evil side of a species consumed by greed. And the persisting spirit in some eager to save rhinos from extinction. I will focus on the latter in celebrating World Rhino Day. 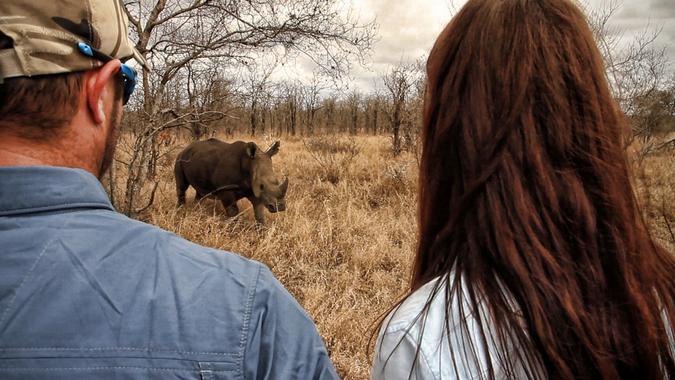 While filming, I’ve spent time with well-known stars, or idols if you’d like, who have chosen to shine a light onto rhinos. The people’s favourite prince, Prince Harry has been in the country several times visiting the Kruger National Park. The first time he came in under the radar he spent time sleeping out under the stars with our rangers and got to know the extent of the crisis. And like his mother, who was passionate about certain issues and clever in getting the media to focus on an issue, he promised to bring back the media on an official visit – which he did. The images of him meeting the K9-ranger and standing at a rhino carcass crime scene were beamed around the world and made the front pages in London. He had certainly shone a spotlight and many learned about the issue for the first time thanks to the Duke of Sussex. Prince Albert of Monaco puts on an event annually at Montecasino to honour those at the frontlines of the fight to protect our rhinos, and various film and television stars also lend their voices to causes for rhinos. But one of our local celebrities stands out for me. 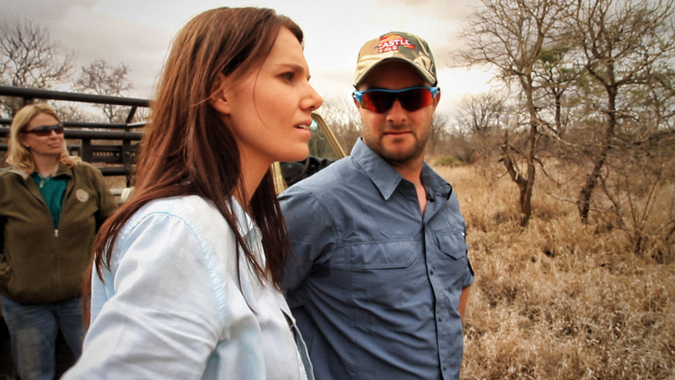 From the cricket field to the field of rhino conservation, Mark Boucher quietly gets things done for our rhinos. I met the ex-Protea wicketkeeper during a micro-chipping and DNA sampling of rhinos out in the field. The DNA samples are then put into the RhODIS rhino DNA database which was started by Dr Cindy Harper at the Veterinary Genetics Lab at Onderstepoort in Pretoria. This is, in my opinion, one of the most important tools in the poaching fight. Once a horn is seized from a trafficker or poacher, the DNA database can link it directly back to the actual crime scene. It has been used in court many times to convict poachers, in fact I’ve seen it used successfully a few times. Mark continues to support this vital initiative and as he told me, “We don’t want to go to sleep on the whole matter and then wake up and the species is gone”. Dr Jane Goodall needs no introduction. The famous primatologist started her career as a young girl studying chimps in Gombe National Park. It wasn’t easy as conservation was very much a male-oriented industry back in the day, but soon her groundbreaking work broke all barriers. Her findings that animals have personalities just like humans got her noticed. 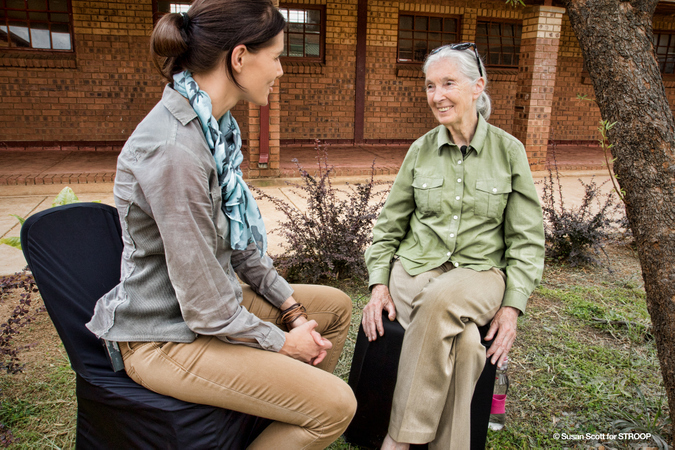 It was when I sat down with her for an interview when I realised just how much she has done for humanity’s connection to animals. For an hour we chatted about the poaching problem and she brought it home to me that rhinos may be these massive beasts from a bygone era but that each of them very much has their own unique personality. It made perfect sense to me. At the age of 84, Dr Goodall still travels for most of the year to inspire people to reconnect with nature and to fight against destroying it. One of the highlights of the film is after a particularly bleak section about rhino orphans in the wild, where we see world-famous orphan rehabilitator Karen Trendler being called out to rescue a two-day old white rhino calf. 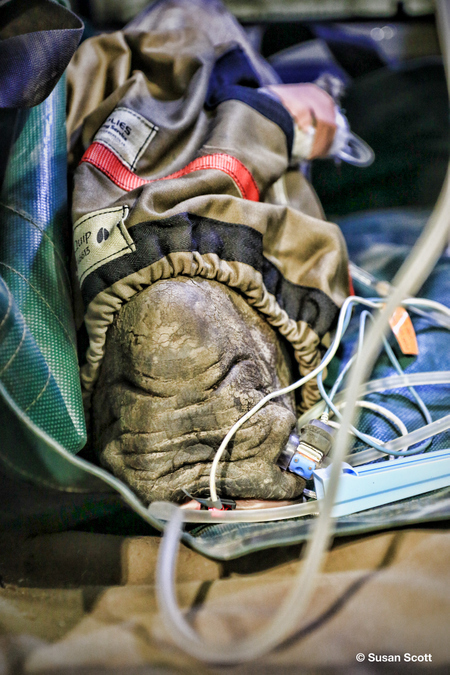 Logistics were difficult getting the calf out and late in the evening we met the calf sedated on the backseat of the vet’s vehicle at a busy petrol station in rural KwaZulu-Natal. The little calf was on a drip and all her vitals were being monitored when an inquisitive onlooker popped her head in to look. “Ooooohh! How old is she?”, “The rhino is the King’s symbol!” and “This is prophetic!” came from the onlooker and her retinue. 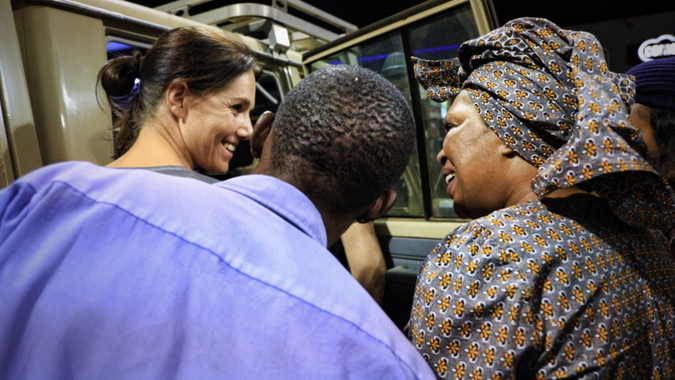 In parting, Queen Mantfombi said she is a fan of wildlife programmes and that she was looking forward to the film. I can’t wait to screen it with her! For three hours after the screening, one after the other came forward to say pretty much the same thing. That there’s a sense of real ownership of rhinos by all who inhabit the planet, for the first time I can say that I finally understand why it’s called WORLD Rhino Day.